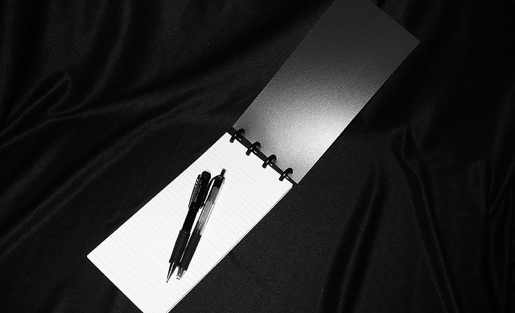 Photo of reporter's notebook by grafixtek on Flickr and used here with Creative Commons license. Edson C. Tandoc, Jr., a Fulbright Scholar at the Missouri School of Journalism, co-authored this post. Earlier this month we published a scholarly article in Quorum, the online edition of the N.Y.U. Journal of Legislation and Public Policy, exploring the definition of a journalist. We culled a variety of sources that conceptualize a journalist in some way, and we analyzed each conceptualization to identify its elements — the primary constituents of a journalist’s matter. Then we used the elements to develop a definition reflecting how a journalist commonly is defined. 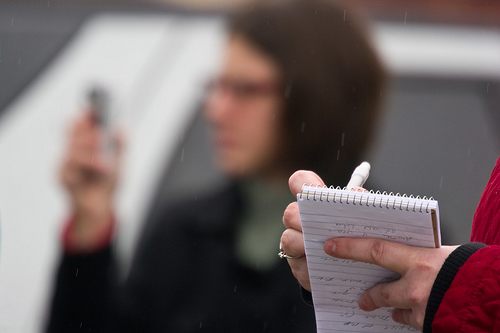 "Although it might seem like an exercise in navel gazing, the task of defining a journalist is important and practical, and now is a good time to take it on." Although it might seem like an exercise in navel gazing, the task of defining a journalist is important and practical, and now is a good time to take it on. But before we go into more detail, a few words to widen the lens. Shortly thereafter, in July, a federal appeals court ruled that a New York Times reporter must testify in the criminal trial of a former CIA officer accused of providing classified information to him. Two members of a three-judge panel for the U.S. Court of Appeals for the Fourth Circuit ruled that reporters do not have a First Amendment right to refuse to testify about their sources. Notably, the Fourth Circuit covers Maryland and Virginia, where most national security agencies, such as the Pentagon and the CIA, are located. Thus, if the decision stands, it could have a major impact on reporting about national security matters. Among other things, the Fourth Circuit decision intensified the debate surrounding the proposed federal shield bill, which would create a balancing test for courts to use before compelling disclosure from reporters. Originally, the bill defined a journalist — entitled to invoke the bill’s protections — as a person who has a “primary intent to investigate events and procure material” to inform the public by “regularly” gathering information through interviews and observations, then disseminating that information to the public. In addition, the bill said the person must intend, at the start of the newsgathering process, to disseminate the information. Ultimately, lawmakers compromised when Schumer crafted an amendment defining a journalist as a person employed by, or in contract with, a news outlet for at least one year within the last 20 years or three months within the last five years; a person with a “substantial track record” of freelancing in the last five years; or a student journalist. The amendment also covers “a person whom a federal judge has decided should be able to avail him or herself of the protections of the privilege, consistent with the interests of justice and the protection of lawful and legitimate newsgathering activities.” With those changes, the bill passed the Senate Judiciary Committee on September 12 by a vote of 13-5, sending it to the Senate floor, where it sits today. Photo by Roger H. Goun and used here under Creative Commons license. The conceptual issue here is that the last 10 years have seen huge swings in media-consumption patterns, and innovations in technology — from mobile applications to the Internet — have created new channels for people to communicate with mass audiences. That has complicated efforts to define a journalist, an issue relevant under not only federal shield bills but also under the federal constitution, state shield statutes, state retraction statutes, and press credentialing policies, all of which contain language defining a journalist. Some definitions are broad enough to include bloggers and citizen journalists, while others are narrow enough to exclude them. Our study grew out of that morass. As noted earlier, we culled a variety of sources that conceptualize a journalist in some way, ultimately to develop a definition reflecting how a journalist commonly is defined. But we limited our culling to the scholarly, legal, and industry domains. For the scholarly domain, we reviewed academic works (e.g., surveys) that defined a journalist or otherwise discussed the characteristics of one. For the legal domain, we reviewed case law and statutes (e.g., shield laws) that defined a journalist or otherwise discussed the characteristics of one. And for the industry domain, we reviewed definitions of a journalist contained in the membership criteria of journalism associations (e.g., the Society of Professional Journalists, whose president responded to our study here). Because there are so many texts and sources that define a journalist explicitly or implicitly, one of our biggest challenges — and one of the limitations of our study — was selecting the texts and sources that we focused on. In the end, we chose the ones we did because we thought they were the richest in description, but we’re considering a follow-up study that would address other texts and sources in order to create an even more comprehensive analysis. At any rate, after culling the sources and analyzing each conceptualization of a journalist, we identified common elements and offered this definition of a journalist (the italicized words represent the elements): A journalist is someone employed to regularly engage in gathering, processing, and disseminating (activities) news and information (output) to serve the public interest (social role). Breaking things down, to be employed means the person’s primary source of livelihood comes from journalistic activities, including the gathering, processing, and disseminating of news and information. The person’s role is to serve the public welfare (e.g., reporting on issues central to society’s well-being in matters of health, safety, order, morality, economics, and politics). As an output, news and information reflect not only journalistic activities (e.g., processing in the form of analysis) but also the ethical principles (e.g., fairness) that govern those activities. Finally, the person must engage in the journalistic activities on a regular basis (the exact meaning of regularity is open for debate). To be clear, we did not offer that definition as normative. It’s descriptive. It simply unifies the conceptions of the three domains and the elements that others have used to define a journalist. In other words, the study states 1) this is how a bunch of sources have defined a journalist, 2) this is a definition that unifies how they have done so, and 3) this is why that definition is unwise. The third point is critical because, as we conclude in the study, it would be unwise to adopt a definition that excludes unpaid bloggers and citizen journalists who gather, process, and disseminate news and information on matters of public concern. From contributors to CNN iReport, to editors at Circa, to reporters at the New York Times, all are capable of committing acts of journalism. Some do it better than others, some have more resources than others, and something is gained when reporting is done by stable organizations with money, logistics, and legal services — but all are capable. By referring to employment, the definition delivers a fatal blow to the people engaging in many new forms of journalism. To the extent the definition is used to decide who may claim the legal privileges of journalists, it puts a large number of actors in the journalism ecosystem in the position of fulfilling community needs for news, however well the actors do so, without the assurances that keep traditional journalists safe when their work provokes a backlash. Again, that’s unwise. As those forms evolve, perhaps as they become more collaborative and interactive, it is possible that the people behind them will not qualify for narrowly drawn shield protections. Thus, they would face an increased risk of liability connected with their journalistic activities, and that increased risk might deter innovation. Whether this is an imminent or remote possibility, we do not know. It deserves further study, exploring the extent to which innovation in news production and distribution is predicated upon legal risk and legal protections, including the reporter’s privilege. *Parts of this post have been excerpted or adapted (with permission) from the authors’ scholarly article and from a related article that Peters authored for the American Bar Association. Jonathan Peters is a media lawyer and an assistant professor at the University of Dayton, where he teaches journalism and law. He blogs about free speech for the Harvard Law & Policy Review, and he has written on legal issues for The Atlantic, Slate, The Nation, Wired, PBS, and the Columbia Journalism Review. He is a volunteer attorney for the Student Press Law Center in Washington, D.C., and for the Online Media Law Network at Harvard University. Peters is the First Amendment Chair of the Civil Rights Litigation Committee of the American Bar Association, a member of the Media Law Committee of the Ohio State Bar Association, and a member of the Board of Directors of the ACLU of Ohio. Follow him @jonathanwpeters on Twitter. Edson C. Tandoc, Jr., is a Fulbright Scholar and doctoral candidate at the Missouri School of Journalism, where his research focuses on the sociology of news. He has conducted dozens of studies on the construction of news and social media messages, and his work has appeared in a variety of peer-reviewed journals, including Cyberpsychology, Behavior and Social Networking, the Journal of Information, Technology and Politics, Social Indicators Research, and Journalism Practice. He has received numerous awards for his research. Tandoc worked for many years as a national political reporter in the Philippines. Follow him @iamedson on Twitter. What about trust and accountability? I recall having to apply to take notes in the New Zealand Court of Appeal as an unproven and unattached journalist. The court official was not impressed. The bench granted the right immediately. QED. Here’s a simple solution: Anyone anywhere anytime “committing acts of journalism” should voluntarily take the “TAO of Journalism” Pledge to be Transparent, Accountable and Open and display the TAO Seal. Then let their readers, viewers and listeners hold them publicly accountable. See http://taoofjournalism.org to see how it works. Feedback welcome! What if it is even more “messy?” What if journalists are self-defined and need no license or state-sanctioned definition? What if freedom of speech and freedom of the press are recognized as freedoms of public expression available to all? What if our freedom depends on a fourth estate willing to defy the state to give us information we want which government may prefer to keep under wraps?